Meet three unusual penguins and find out more about them. See lots of African penguins on a sunny beach. Watch Emperor penguins walk, slide, swim and leap in and out of icy water. Find out about Emperor penguin chicks and how their parents care for them. Try a test-yourself quiz about penguins. 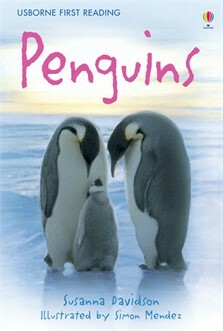 A fun dive into the world of penguins, how they swim, feed and move, and how chicks grow and survive to become adults. Combines fascinating information with simple flowing text to excite and further inspire beginner readers. Includes short glossary, index and internet links to carefully selected websites.